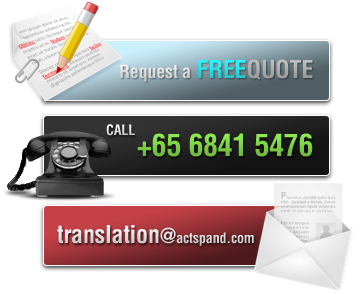 Actspand Pte Ltd is a Singapore-based company that specializes in providing quality professional translation services in all major languages for business, legal, financial, medical as well as other specialized documents. With our experienced team of native speaking linguists and an established system of project management, we are glad to be serving a broad range of regular clientele from the USA, South America, Taiwan, Hong Kong, Singapore, among others. We also pride ourselves in being a preferred translation vendor to multinational translation companies by offering high-quality and prompt language solutions at competitive rates. Our range of services includes translations, editing, proofreading, copywriting, and transcription.